Volume 3 features and incredibly diverse range of Koi ponds, and meets the dedicated individuals who manage these awesome systems. 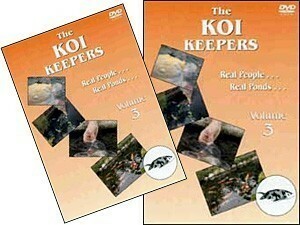 Many award-winning koi are featured, specifically the 2003 BKKS Grand Champion, resplendent in her stunning home pond. Many fish are also seen in the bowl, which lets the viewer see a close quarters the awesome quality of these Nishikigoi. A detailed run-down of each featured system, together with an on-screen interview with the hobbyist, allows for a totally unique, unhindered view of some of the best ponds the United Kingdom has to offer. Producer: New Vision Videos, Run-time: 65 minutes. PAL (Region 0) format. This DVD will play in all computer based DVD drives, and most home DVD players.